But the time has come to get back into the swing of things. I’m planning on posting once a week on Wednesdays, and then as things settle down even more I will bring back the Saturday post/video. Today’s post is my long awaited birth story. As my due date got closer and closer I began looking up as many birth stories as I could to see what other people’s experiences were and see what may be in store for me. With that in mind I went into quite a bit of detail to help out all of you soon to be mamas. It may be too much detail for those not entering motherhood, but I like to help out where I can and I know how much I liked reading more in depth birth stories. Originally we had planned a home birth, but after many days of labour, building pain, and a swollen cervix we decided to go to the hospital to complete the delivery. It definitely wasn’t the labour and delivery that I was expecting/hoping for, but in the end it was all worth it the moment they brought Logan up to my chest. I’d also like to give a special shout out and thank you to my midwives from Roundhouse Midwives, Natalie, Sarah Jane, and Mary Jo, and my Doula Bri, the awesome team at Victoria General Hospital, and my awesome husband Matt who was such a supportive trooper throughout the entire thing. I started to have pre-labour contractions at around 10:00 pm the day before my due date. Small contractions continued throughout the evening. I tried to sleep, but it was hard as I was getting excited to meet our baby boy. When Matt woke up I told him to go to work because I knew that it could still be quite a while before the big moment. By roughly 7:00 am contractions subsided for the daytime. I had a midwife appointment which confirmed that things were happening, but my cervix was only 1 cm dilated. They tried to do a stretch and sweep, but because of the size of dilation they were only able to do a stretch and try to pull the cervix to a more forward position. Contractions started building to 2 – 8 minutes apart and lasting for roughly a minute. We decided for Matt to take the next 2 days off work before the weekend, and called my Doula. She arrived at around 5:00 am. I continued going through the contractions and had a small apple snack to maintain my energy. The contractions started to slow to roughly 7 minutes apart lasting for about a minute. My Midwife arrived at around 7:00 am. She checked my cervix and it was still only 1 cm dilated. The Doula and Midwife left and we were told to no longer time contractions. The contractions came and went throughout the day but I tried to ignore them as much as possible. They ramped back up in the evening, but again I tried to ignore them. They became too intense to get much sleep so we decided to meet the midwife at the hospital for a shot of morphine and gravol that would allow me to get some rest. The shot helped and I was able to get a 2.5 hour stretch of sleep before the contractions became too much again. Matt and I decided to try and distract ourselves until the contractions became too much. We went out for breakfast, and went to my Mother in Law’s so we could grab her Nintendo Wii. I continued to have contractions that built in intensity. We played a couple levels of Super Mario and had to keep pausing it during contractions. I took a bath which seemed to help with the pain, and as the contractions became closer together we called my Doula. She arrived around 3:00 pm. At around 4:00 pm the contractions became even closer together and more painful. My Doula encouraged me to walk up and down the stairs to try and open up my hips and get baby Logan into a good position for delivery. I then got sick and Matt called the midwives to come over. They arrived at around 6:30 pm and did a check. I was 5 cm dilated, it was a little less than I had hoped, but I was happy things were progressing. My two most comfortable ways to labour were in the bath tub with acupressure balls pressed into my hips, and sitting on the toilet in a squat position with my feet on our squatty potty. I continued to labour like this for another hour until my water broke, luckily I was on the toilet! The next 3 hours were very intense. My midwives had me labour on the bed leaning over an exercise ball. Matt ordered pizza for him and the birth team to eat to keep their energy up. It must’ve been quite the delivery for the pizza guy as he came to the house while I was in the middle of intense contractions and he asked if everything was ok and if there was a doctor there. It was probably one of the strangest deliveries he’ll ever do! After that in an effort to open up my hips more the midwives had me sit on the exercise ball and lunge into a step stool with each contraction. Things continued to build up in intensity and the only way I could find some relief was with someone intensely pushing into my hips, but even that was losing effectiveness and my hips became more and more painful. We decided to try sterile water injections that are supposed to relieve back and hip pain for 30 – 60 minutes. They say that the pain feels like a stinging sensation like a wasp sting. I have a fairly high pain tolerance, and for me the sterile water injections were extremely painful. I screamed bloody murder and they were honestly probably the worst part of my entire labour. The midwives did another check, and after that I was only dilated a disappointing 6 cm and my cervix had become swollen. We made the decision to move to the hospital to get some pain relief and try to rest and let my cervix calm down. We had an intense drive to the hospital where I was bent leaning over the car seat base. Thankfully we live just over 5 minutes away! Once we got to the hospital they gave me some wonderful laughing gas that really really helped until they were able to put in my IV and get me an epidural. The laughing gas was honestly so helpful and aside from the pain relief it really helped me liven up and lighten the mood. For my next child I plan on being at the hospital and hopefully the laughing gas will be enough to help with the pain throughout the contractions, although I’m not against having an epidural again if it’s needed. By 1:30 am the epidural had finally taken effect. I tried to get some rest to build up some energy and let the swelling calm down. I was able to get some sleep off and on and at 4:00 am I was 8 cm dilated and no longer swollen. My contractions continued to be irregular in spacing so they gave me oxytocin to try and get them closer together. I rested some more and by 5:45 am I was finally 10 cm dilated!! At 8:10 am it was time to push! With the epidural I found it hard to know exactly how to push. What helped was to have my midwives press against where I needed to push. For pushing I had used the squatting rack, but what worked best was for Matt and whatever doctor/nurse/midwife that was around to hold my legs up, pressing my knees up and as close to me as they could. I ended up with so many weird bruises all over my body from people grabbing on to me and holding me in different ways. I had some trouble delivering the umbilical cord and placenta which delayed my chance to have more than a brief moment of skin to skin with him. Matt ended up getting the first long period of time with him, and as soon as they allowed it they brought Logan over to me. We had planned on only staying at the hospital until the evening, but after we thought about it we decided it was best to stay the 24 hours so I could get help from the nurses for breastfeeding. In the end I was so happy that we made that decision. Originally I didn’t want to be at the hospital at all, but after everything I was very happy with the experience. All of the nurses were so nice and they really helped with tips for breastfeeding. My only complaint is that the food is terrible and the staff only cared about me, and didn’t really care about my husband at all, so make sure to bring lots of food for you and your guy. So happy you both are happy and healthy! That is all that matters! wowww, i am glad you are all doign great! 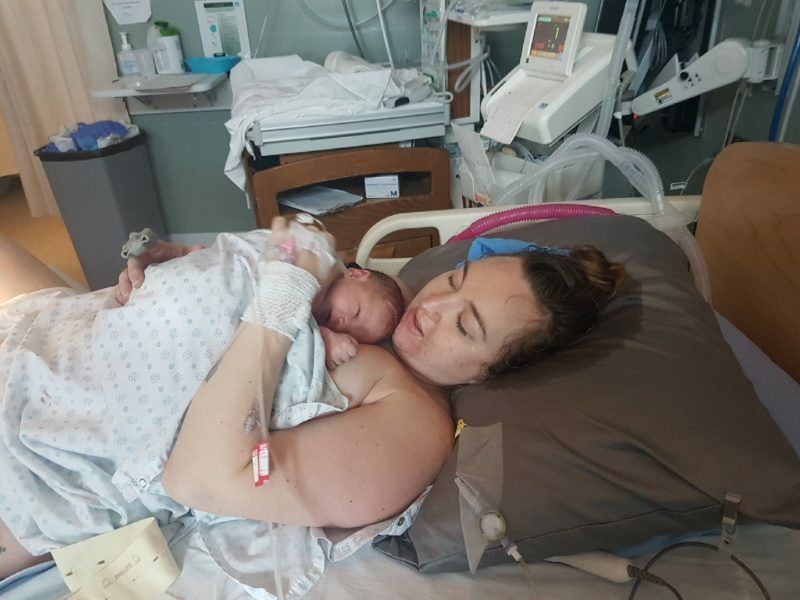 I always wanted a home birth but after reading so many birth stories, i decided i would prefer to be in the hospital and thank God i decided on that cause it was intense. Wow!! What a long process!! Congrats to you!! I just had my little girl 7 weeks ago!! Your birth story is so inspiring, especially to new parents. Congrats!!! The baby is looking so so cute. motherhood experiences and tips, healthy recipes, and not so healthy recipes, lifestyle tips, home decor, beauty tricks and more! If you’d like to learn more about me you can connect with me on Instagram @HappyStylishFit or read more on my About Me page. 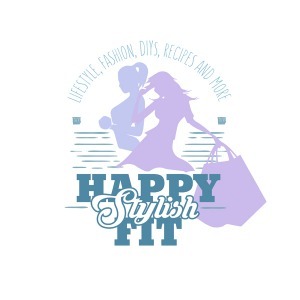 Receive biweekly updates about all things Happy Stylish Fit. Copyright 2016 - 2018 Jannine MacKinnon. All Rights Reserved.